← What Are Bag Marks? 1. Coins are small, easy to store, carry and hide! You could collect classic cars or luxury yachts, but coins won’t require building a garage or renting a slip. They are easy to store under your bed, in a file cabinet or a safe deposit box. And no one needs to know you have a stash of coins at all! Coins are also easy to transport. If your collection has monetary value this can be a VERY important consideration. 2. Coins are durable and lasting. Coins are resilient and hold up for centuries and more. They won’t rip or deteriorate like stamps or break like glass or china. Although coins need to be handled with care, they are a wonderful collectible you can display, share and enjoy without much worry. 3. Coins are everywhere. You can start your coin collection right now with the items in your pocket or purse. 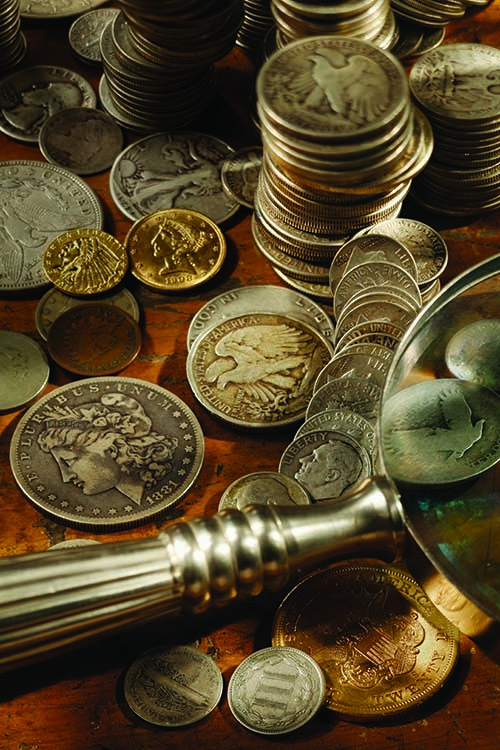 You’ll find older coins at antique shops, flea markets and coin shops. Coins are available for sale online, through catalogs and at coin shows. Collectors are everywhere as well. Once you start your own collection you’ll discover how many other coin fans share your interest. 4. Coins are affordable. Although some rare coins can be very pricey, most items are wonderfully affordable. You can be a collector no matter what your budget limitations may be. Start with an affordable series in a grade you can afford and work up from there. 5. Coins tell stories. Every coin has a history. Through collecting you can learn about historic events, important people, places and much more. When you collect coins you’re holding history in your hands. It is fun to imagine who else might have held that coin and what transactions it might have been a part of. Was that Morgan dollar earned by a cowboy on the range? Did a gambler use it in a card game? Was that vintage penny spent by a child in a candy store? 6. Coins are beautiful and artistic. Each coins is actually a tiny work of art. Some of the world’s finest craftsman have designed the engravings featured on coins. And today the beauty of coins goes beyond the image. Many designs now include extra features like colorization or an interesting shape. There are even coins that include a special aroma! 7. Coins are diverse. As a collector you can choose from U.S. coins or the great multitude of foreign coins. Modern issues, as well as vintage coins are wonderfully collectible. Your focus can be on silver and gold coins. You’ll find colorized coins, holographic coins, interesting shaped coins and much more. There are coins devoted to animals, historic events and special places, just to name a few. 8. Coins are important. Not only are coins essential in everyday life, but coin collectors play a crucial role in preserving history for future generations. Without this extremely important hobby countless coins would be lost to posterity. Without numismatists, future generations might never get to see an ancient lepton or a U.S. large cent. As it is, we continue to lose important coin artifacts to attrition and melts. 9. Coins are fun. Each time you find a new item for your collection you’ll get that collector’s thrill. And when you finish putting together an entire series or collection you’ll feel an even greater sense of satisfaction. And even just getting out your collection to pour over your past finds is great fun! 10. Why do you collect coins? I know I promised nine reasons to collect but there surely are many, many more benefits. Why do you collect? Answer in the comment section below and help encourage new enthusiasts to the hobby. This entry was posted in Collecting Advice and tagged Best reasons to collect coins, Why should I collect coins. Bookmark the permalink. I have always thought that old coins were very cool, and had an uncle who used to collect them. I think it’s very cool that coins can tell a story, and that each coin can have a history. It’s things like that that make a hobby into something great.